I recently received a postcard in my daughter’s pre-school book bag. 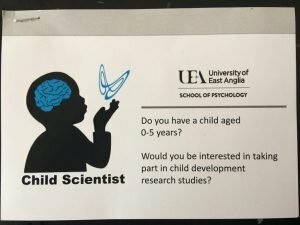 It was an invitation to take part in a research study at the University of East Anglia. 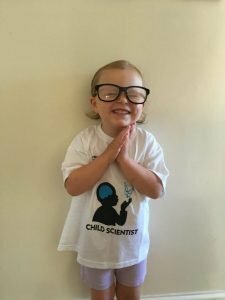 I asked Ruby if she would like to be a scientist for the day and she was won over by the fact that she would receive a T-shirt and a small toy to say thank you. On arrival to The Lawrence Stenhouse Building within UEA grounds, we were greeted in the car park and taken to the Developmental Dynamics Lab. The waiting room made Ruby smile – a fisher price telephone just waiting to be used! ” I need to call Grandma” and off she went to make her important phone call. There were lots of games and puzzles including an ABC picture abacus which she immediately took a shine to and demanded that we visit Asda on the way home to buy one. The researcher led us to a small suite with a large TV screen and a chair, where he asked if Ruby could sit on my lap and face the screen. I had to wear blacked out sunglasses to restrict my reactions and body movements. This would then enable Ruby not to be influenced by me. A sticker of an eyeball was placed between Ruby’s eyes above her nose and this would be an extra aid to monitor her eye movements. Elmo the muppet character from Sesame Street appeared on the screen, followed by a series of shapes and words that were not in the English language. Ruby was very well behaved for about 5 minutes then decided that the eyeball sticker would look better on mummies face! Shortly after, the researcher came into the room and asked Ruby to follow him to her next task. She was shown a flash card sequence with 4 different images on each card. She was asked to identify specific images out of the 4, e.g. point to the castle, where is the hedgehog, who is sad? She was very successful at this and I felt very proud of her. At the end of the study she was presented with her T-shirt and a bottle of bubble mixture. She wore her T-shirt every day for a week. Post written by Tracy from our Norwich office.